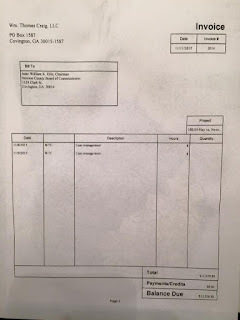 Based on a copy of an invoice that the Chronicles were made aware of, it apparently seems that the law office of Wm. Thomas Craig, Esq. had submitted an invoice for services rendered in the amount of $12,528.88 to Newton Co. for an un- itemized list of services of 16 hours worth of "case management." 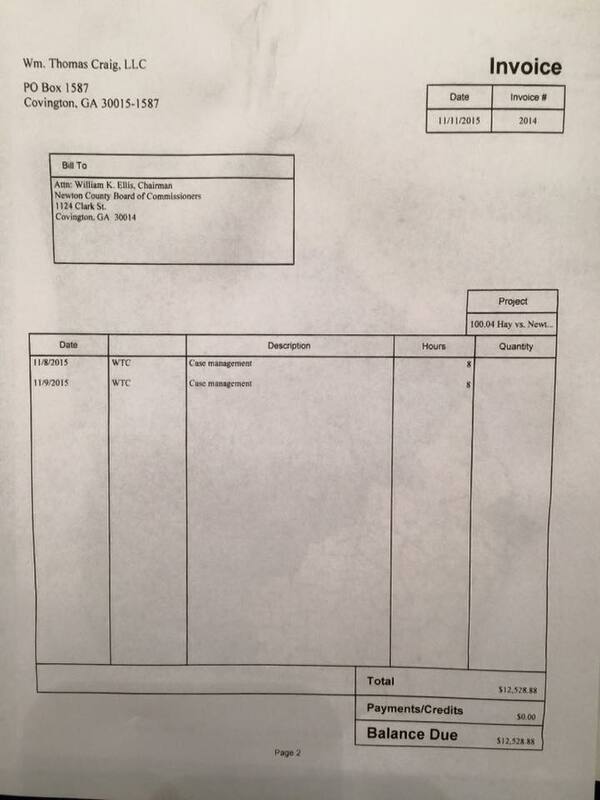 As an aside, this invoice for work was done on the case, Hay vs. Newton Co., in which, according to our sources and understanding, the county decided to sue a citizen of Newton Co. for filing ORRs and questioning certain goings on of the home county. If anything, this shows more and more that Newton Co. had, in our estimation, become more and more obtuse and tone-deaf, and that, quite possibly, we'd been dealing with a county attorney who was becoming more and more out of control. And while the county has moved on to on new, interim legal team, and are no longer using the services of Wm. Th. Craig for new business or issues, it is our understanding that Craig is still the counsel of record on several cases in various court circuits and will be for some time. It is also our understanding that Craig is still very heavily involved with several various state-sanctioned agencies in Newton and other counties and has the potential for various residual monies, commissions, other fees, etc. down the road. Lots of questions. Lots of moving parts.